BIMM Institute is a group of independent music colleges, catering for 4,500 students throughout the country. BIMM provide courses for playing instruments as well as song writing, music production and music teacher training. 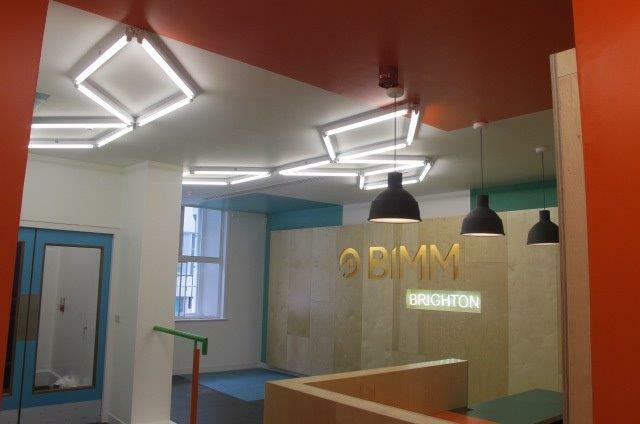 BIMM Brighton require works for the conversion of a recently leased building, in order to provide a new student common room, administration offices, and refurbishment works within their existing building. Designed by Ben Kelly Design (BKD) one of the most respected and influential interior designers in the UK. This project was carefully managed to allow the safe and efficient operation of the College to continue whilst construction work took place. Fellows provided a full range of pre and post contract services including: appointment of design team; programming; cost planning; value engineering; contract conditions; tendering procedures; contract documentation; Employer’s Agent services; monthly cost reporting; advising the client of contractual obligations.